Mark Zuckerberg's big European test did not go well. The Facebook (FB) CEO apologized for the company's mistakes but angered European lawmakers by dodging their questions. 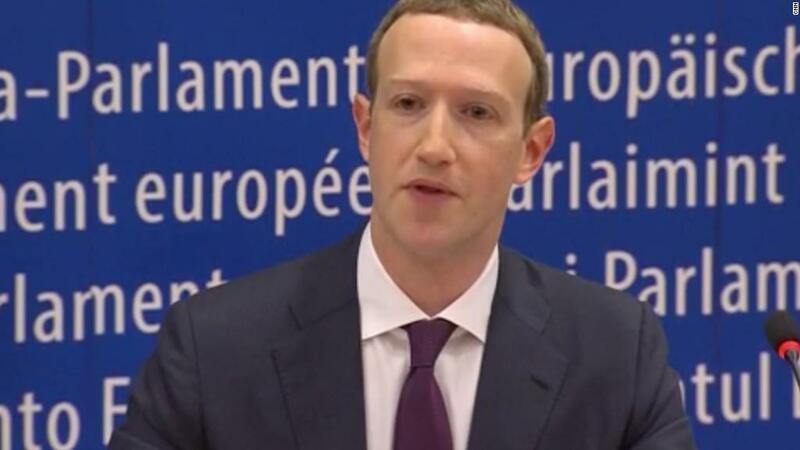 Zuckerberg was questioned on Tuesday by political leaders and lawmakers at the European Parliament in Brussels for about 80 minutes. His replies left them mostly frustrated. They used the last few minutes of the meeting to complain and accused him of giving general answers. "I asked you six yes and no questions," Philippe Lamberts, a Green party politician, said. "I got not a single answer." The setup of the meeting was largely to blame. The lawmakers were given three minutes each to ask their questions one after another. Zuckerberg was allotted time at the end to answer them. As time ran out, Zuckerberg promised Facebook will respond to each of the lawmakers' questions in writing in the "next few days." This is a standard format for meetings of the group, according to the parliament's spokesperson. However, the parliamentarians pushed back at Zuckerberg for not agreeing to attend a full committee meeting, similar to the one he attended in the US Senate. "You asked for this format for a reason," Lamberts told Zuckerberg. Guy Verhofstadt, chair of the Alliance of Liberals and Democrats for Europe, called the format "pre-cooked" and said it "ensured Zuckerberg could avoid our questions." "I trust that written answers from Facebook will be forthcoming," he wrote on Twitter after the hearing. "If these are not accurately answered in detail, the EU competition authorities must be activated & legislation sharpened." The group asked Zuckerberg about fake news and extremist content, accused him of "censorship" and suggested Facebook should be broken up into separate companies to increase competition. Zuckerberg apologized for how Facebook (FB) handled issues related to fake news, foreign interference in elections and the personal information of its users at the start of the meeting. "We didn't take a broad enough view of our responsibility and that was a mistake and I am sorry for it," he said, effectively repeating a line that he used when testifying before Congress last month. As he has done on numerous occasions in recent months, Zuckerberg pledged to double the number of people working on Facebook's security and said the investment will "significantly impact [Facebook's] profitability." "Keeping people safe will always come before maximizing our profits," he said. 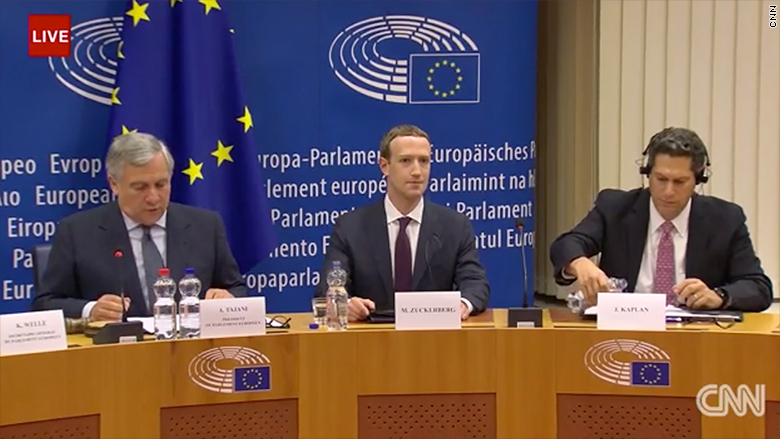 Zuckerberg first met the parliament's president Antonio Tajani. He then faced a bigger group of lawmakers, known as the conference of presidents, to answer their questions. Multiple members of the European Parliament pressed Zuckerberg on whether Facebook is a monopoly, with one asking whether the CEO could convince him that the company does not need to be broken up. Zuckerberg said Facebook exists "in a very competitive space," pointing out people use different tools to communicate. "From where I sit, it feels like there are new types of media all the time," he said. The lawmakers also raised the issue of extremist content on Facebook, pressing Zuckerberg on the need to remove hate speech faster. Zuckerberg said Facebook has developed a series of features, including artificial intelligence tools, to tackle the problem. As was the case when he appeared before Congress, Zuckerberg largely avoided answering questions about Facebook's data collection practices, including the data it gathers from non-users. Daniel Ives, an analyst with GHB Insights, wrote in an investor note Tuesday that he expects "more back and forth between the EU and Facebook over the coming weeks." That said, Ives said the hearing marked "another step forward for Zuckerberg post Cambridge,"
The meeting came two months after news surfaced Cambridge Analytica, a data firm connected to President Donald Trump's campaign, had access to information on up to 87 million Facebook users without their knowledge. As many as 2.7 million of these users were European residents, according to the European Commission. "Facebook, and Zuckerberg in particular, has been seen as uncooperative, even actively resistant towards European law and attitudes for a long time," said Paul Bernal, senior lecturer in IT and media law at the University of East Anglia. "If the authorities decide to play hard ball, Facebook could have a big fight on its hands."